Famous Israeli filmmaker Menahem Golan, who produced and directed more than 200 films, dies at 85. 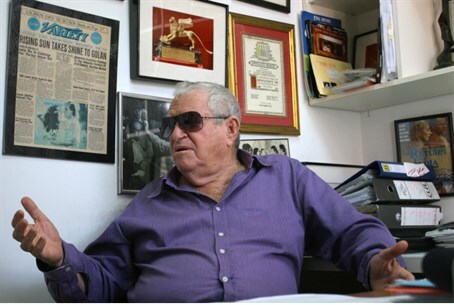 Famous Israeli filmmaker Menahem Golan, an Israeli cinema pioneer, died Friday at the age of 85. According to The Hollywood Reporter, Golan lost consciousness while strolling outside his house in the city of Yafo (Jaffa) with family members in the early hours of Friday evening. Ambulances rushed to the scene, and following attempts of more than an hour to resuscitate him, paramedics pronounced him dead. With his cousin and partner Yoram Globus, Golan ran the Cannon Films production company for a decade, releasing more than a dozen films a year in its prime. The two bought the ailing company, which was launched in 1967, for $500,000 in 1979 and fueled an appetite for B-films that was created by the invention of the VCR. For a time, Cannon was on the brink of becoming the seventh Hollywood “major” studio. "I'm in complete and utter shock; I cannot come to grips with the news", Globus told The Hollywood Reporter from his home in Tel Aviv. “Menahem lived, breathed and ate cinema, and he is undoubtedly a founding member of the Israeli cinematic landscape, locally and all of its appeal internationally,” he added. Golan produced more than 200 films including the action hits The Delta Force (1986) starring Chuck Norris and the Death Wish sequels toplined by Charles Bronson. He also produced such high-octane fare as Missing in Action (1984), also starring Norris, and its sequels; The Texas Chainsaw Massacre 2 (1986); the lightly regarded Superman IV: The Quest for Peace (1987), which effectively disabled the franchise for years; Masters of The Universe (1987), starring Dolph Lundgren; and Jean-Claude Van Damme’s Kickboxer (1989). In Israel, Golan founded Noah Films, named after his father. Noah Films was behind Academy Award nominated films 1972’s I Love You Rosa and 1973’s The House on Chelouche Street. In 1977, Golan directed Operation Thunderbolt, based on the previous year’s real event of the Israeli raid on Entebbe airport in Uganda, a movie that was nominated for an Academy Award for best foreign language Film and led the way for the cousins to try and conquer Hollywood. That movie starred famous Israeli singer Yehoram Gaon. Born Menahem Globus to Polish immigrants on May 31, 1929, in the northern Israeli city of Tiberias, he changed his surname for patriotic reasons to the Hebrew name of Golan upon serving in the Israeli Air Force. Golan finished filmmaking studies at the Old Vic School, the London Academy of Music and Dramatic Art and New York University, he returned to Israeli and directed for the stage. Over the past two decades, Golan focused on local productions and was the recipient of Israeli Film Academy’s Ophir Award for Lifetime Achievement and The Israel Prize, given annually by the government for excellence and contribution to cinema.